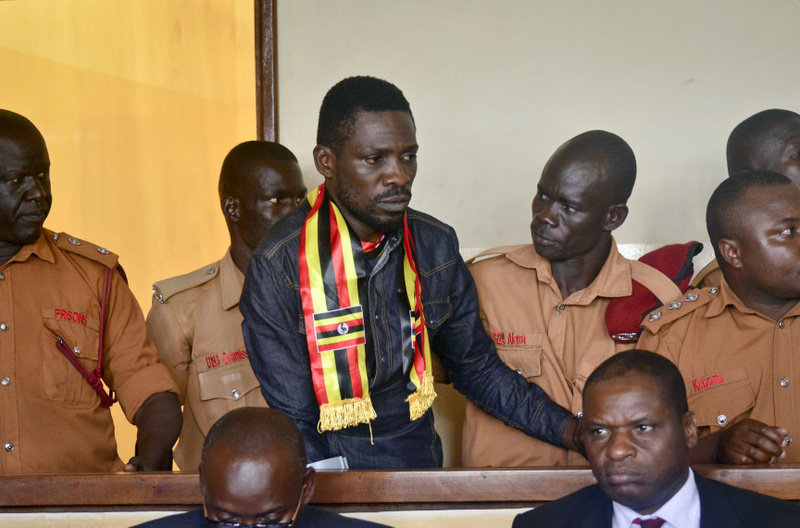 KAMPALA, Uganda (AP) — A Ugandan pop star-turned-opposition lawmaker said Saturday he has arrived in the United States for medical care after allegedly being tortured while in detention. Bobi Wine, whose real name is Kyagulanyi Ssentamu, said on Twitter Saturday that he suffered "brutal torture" by soldiers with the presidential guard, allegations the government has denied. He posted a photo of himself in an airport corridor, sitting in a wheelchair and holding crutches, though it wasn't clear which city he was in. Ssentamu left Uganda late Friday after an attempt to leave the previous day was blocked by officials who said he needed first to get clearance from the government because of his allegations of torture. Ssentamu and several other lawmakers are charged with treason over an incident on Aug. 13 in which the president's motorcade was pelted with stones. Ssentamu was freed on bail Monday. Video posted by human rights attorney Nicholas Opiyo showed the 36-year-old singer in his trademark red beret and carrying crutches as he was wheeled to the departure gate late Friday, saluting and thanking supporters along the way. Another lawmaker who was blocked on Thursday from flying to India for treatment, Francis Zaake, was still being held in a hospital Friday night. Ssentamu has emerged as a powerful opposition voice among youth frustrated by President Yoweri Museveni, 74, who has been in power for 32 years and oversaw a constitutional change last year to remove an age limit on the presidency. The treason charges have heightened concerns about a crackdown on the opposition in this East African nation. Museveni, a close U.S. security ally, has spoken in recent days about "unprincipled politicians taking advantage of our unemployed youth to lure them into riots and demonstrations."